The Amazing Spider-man director Marc Webb has gone back to smaller scale films since his seourn into superhero territory. First with Gifted, and now with The Only Living Boy in New York. Chris Evans may be very busy on the Captain America: Civil War set at the moment, but he’s also figuring out what he’s going to do in between Marvel movies, as Deadline reports that he’s attached to star in Gifted, for director Marc Webb (The Amazing Spider-man). Gifted, ‘focuses onAll Pages a man who sues for custody of his gifted niece’, and will start filming this autumn. The man is Frank, a deliberate underachiever who is looking after his niece even though he doesn’t officially have custody. However, when the girl’s grandmother threatens to destroy the normal life he wants for the child, he sets out to become her official guardian. Webb intends to follow that with The Only Living Boy In New York, which Miles Teller is set to star in. The Deadline reports mentions a couple of other actors are also in talks, with Rosamund Pike and Jeff Bridges circling the project. If you want to be pretty, it would seem that becoming the Green Goblin isn’t the way to go it. 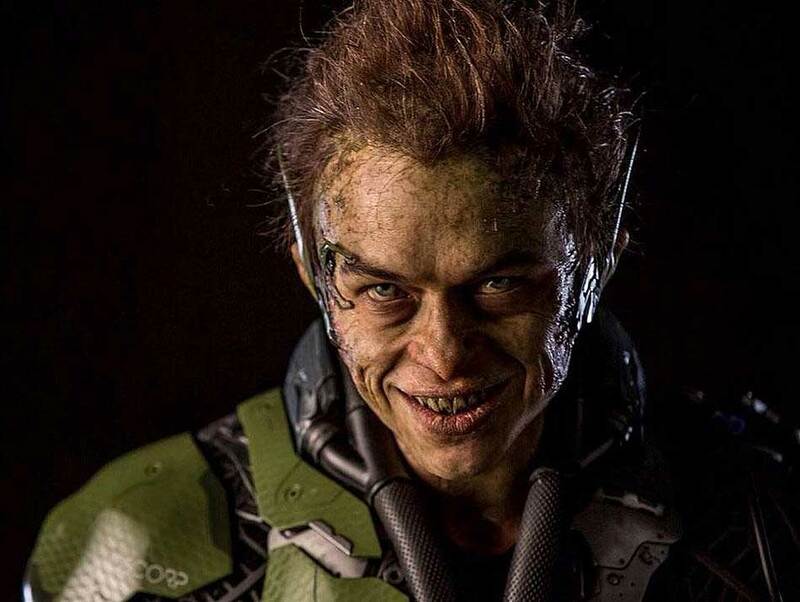 Sony has released the ultimate no makeup selfie (but actually a lot of makeup) for The Amazing Spider-man 2, giving us our first up close look at Dane DeHaan after his transformation into the famed villain. Here’s the synopsis: ‘We’ve always known that Spider-Man’s most important battle has been within himself: the struggle between the ordinary obligations of Peter Parker and the extraordinary responsibilities of Spider-Man. But in The Amazing Spider-Man 2, Peter Parker finds that a greater conflict lies ahead. With fans already moaning that they thought there were too many villains in The Amazing Spider-man 2, earlier promos have concentrated on Electro and suggested it would be mainly him Spidey was up against. However this final trailer changes tack by concentrating on the fact it’s not just Jamie Foxx’s electro, but also Paul Giamatti’s Rhino and Dane DeHaan’s Goblin – and they’re all uniting against our hero. Sony is betting big on The Amazing Spider-man 2, and with the release coming next months, they’ve released the first clips from the movie, featuring a sniper in Times Square with Spidey and Electro, Dane Dehaan & Andrew Garfield skipping rocks, and Emma Stone hiding away with Garfield. The movie is due in UK cinemas this April, with a May 2nd US release set. Amazing Spider-man movie, but it appears he’s looking beyond the world of superheroes, as Deadline reports he’s attacked to direct Cold Comfort, based on the upcoming book How to Catch a Russian Spy, which 20th Century Fox has acquired the rights to. The non-fiction book is about an American civilian who became a self-taught spy and helped bring down a Russian agent operating on American soil. The book was co-written by journalist Ellis Henican alongside this real-life civilian-turned-spy, who will reveal his true identity upon the book’s publication, although it isn’t known when it will be released. Several studios and directors were vying for the rights, especially as it’s seen as being a great project to base around a comedy actor such as Jonah Hill. No screenwriter is currently attached. As Marc Webb has got Spider-man 2 set for this Spring and the third film already planned for Summer 2016, it’s not certain when he’ll fit in Cold Comfort. Marc Webb jumped up the Hollywood food chain with The Amazing Spider-man, and while he agreed to sign on for a second Spidey movie, it wasn’t known if he would be interested in making more. However now Variety reports that Webb has been confirmed to The Amazing Spider-Man 3, which is already set for release on June 10, 2016. Amazing Spider-Man 2 writers Roberto Orci, Alex Kurtzman and Jeff Pinkner are returning to write the script for the third adventure, with Matthew Tolmach and Avi Arad producing. Andrew Garfield is already contracted to be back as Peter Parker/Spider-Man, and last October is was reported that Paul Giamatti will return as Aleksei Sytsevich aka. The Rhino. Chris Cooper, who plays Norman Osborn in The Amazing Spider-Man 2, has also hinted that he will be in part three. However no other cast members have been confirmed. With Spider-man becoming a lynchpin for Sony Pictures (to the point where some investors feel they’re relying on it too much and ought to find some other major franchise) they are also expanding the Spider-Man universe, with The Sinister Six and Venom spin-offs. It’s believed they hope to release a Spidey related movie every year. Sony is betting big on The Amazing Spider-man 2, hoping it’s going to be a huge superhero success. With an April 18th UK release set, it’s not long until we’ll get to see it, and to ensure our appetites are suitably whetted, a new, three-minute Rise Of Electro trailer has been released, which you can watch right here. BFor a long time it’s been known that The Office star B.J. Novak was part of The Amazing Spider-man 2 cast, but everyone has been keeping quiet about exactly who he’ll play. However now it’s been revealed that he’ll be someone who could potentially have much bigger part to play in future films. Director Marc Webb has let the world know Novak is playing Alistair Smythe. The character is the son of Spencer Smythe, who in the comics created the Spider-Slayer robots designed to hunt and kill Spider-Man. Alastair eventually took over from his father, becoming Ultimate Spider-Slayer. Novak has previously revealed that his character works at OsCorp. He also added that he only appears in a couple of scenes in the sequel. However it leaves plenty of potential for the sequels as the movies build to the Sinister Six set of villains, of which Ultimate Spider-Slayer could be a part.